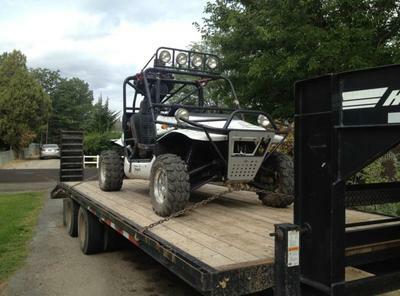 The 2009 Joyner Trooper 4X4 ATV for sale has a roof rack, light bar, front brush guard and winch. Its a 4 cylinder, water cooled, turbo charged, 1100cc motor with a 5 speed transmission and an impressive 70mph plus top speed. It comes with an audio jack, bass Canon and Pioneer speakers so that you can enjoy your music AND the great outdoors. It is fully loaded with $2000 in factory upgrades and currently has only 850 miles on it. and you will note that most opinions state that the Joyner is LOTS faster than the RZR or Wildcat for close to the same price. If you have any questions regarding the used 4X4 or if you would like to make an appointment to see it in person or make payment and pick up you can do so using the space below that has been provided by GoGoCycles Used Motorcycles for Sale and PLEASE do not neglect to include your contact information in your email or to provide a phone number or email address so that I can respond with answers to your questions or set up an appointment as quickly as possible. In my opinion there is not a better deal on a used Joyner as this 4X4 in Grand Junction, CO Colorado, USA, on Craigslist or on Ebay! GoGoCycles would also encourage our biker friends to write a review of the 2009 Joyner Trooper 4X4 ATV for Sale or share any thoughts and/or opinions to make potential buyers aware of any problems that are commonly associated with this brand or to highlight its positive features and help our visitors make informed decisions. My asking price for the Trooper is $5000 only serious buyers should contact me please) and don't forget to mention that you found this ad on GoGoCycles' Used ATVs and Motorcycles Classifieds www.gogocycles.com using the comments forms located on this page. Join in and write your own page! It's easy to do. How? Simply click here to return to ATV for SALE (main).